A razor sharp blade is attached to a lightweight handle, and the combination offers effortless peeling that almost seems like magic. A high quality stainless steel is used for the blade, and it's sharpened on both sides to allow for peeling in either direction, and use by right or left-handed people. A micro serration on the cutting edge reduces tension, allowing you to glide through any food easily, and as you peel rounded fruits and vegetables, the blade will swivel to either side in order to conform to any shape or size necessary. 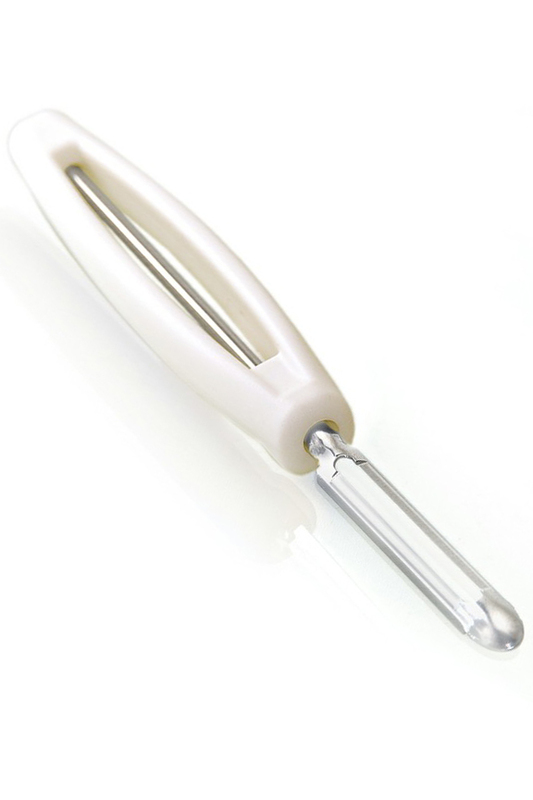 When peeling potatoes, use the stainless steel tip to quickly dig out eyes and other imperfections without slowing down. A metal shaft runs the full length of the tool, but a lightweight handle has been added for comfort and ease of use. The plastic material provides an ergonomic grip, and it ensures that anyone can use it for long periods without strain. Slight pressure will remove super thin slices, or just the outer layer of skin. If you press down harder, you can remove thicker slices. Stop risking your fingers, and taking forever with the low quality tool you have now. Get this Swiss made alternative to fly through your next peeling job with speed and precision. Swiss Made. Lasting quality is guaranteed with this tool. It's made in Switzerland using the best quality raw materials. Double Edge Blade. It's sharp on both sides so you can peel in either direction, and lefties can use it without modification. Swivel Design. Not a traditional Swiss Peeler shape, but some people prefer the vertical blade alignment, and classic peeling knife technique. Easily adapt to any shape of food with the pivoting design. Lightweight. A low weight means increased speed, and reduced effort while peeling. Easily work with large batches, or just ensure comfortable operation at all times. Eye Remover. The rounded tip on the blade is slightly sharpened on the underside to create a scooper for fast removal of potato eyes and other imperfections in your veggies. Dishwasher Safe. Easily clean up after cooking because all parts of this tool are safe for cleaning in the dishwasher. Attractive. Simple and elegant styling join forces with a colored handle and shiny stainless steel to create a tool that would make any chef look good. Professional Quality. Perfect for your kitchen at home, but durable enough, and sharp enough to be used in a commercial setting. Zena leads the Swiss vegetable peeler market, and we carry several other tools they make. If you would like to view the tool that made them famous, then check out the REX. It's the original Swiss Peeler, and it has a wider handle, and a horizontal blade. Want the same thing with a dishwasher safe handle? Then check out the STAR Peeler. It's a more heavy duty, and updated version of the REX. If you like your peelers to be low maintenance, then we also carry the Stainless Steel STAR. It has a stainless handle AND blade, so it can be washed in the dishwasher without any worry of rust on the blade. For tools with specialized cutting edges, take a look at the Star Trilogy Set. It includes three different peelers. You will get a Stainless STAR, a STAR Julienne Peeler, and a STAR Tomi Serrated Peeler. This tool is simple to use, and it works similar to any other peeling tool you've worked with in the past. You will probably find it less frustrating to peel with, but the basic technique will be almost identical. It doesn't matter what hand you prefer to use, which direction you prefer to move in, or what type of food you want to take the skin off of. This powerful potato peeler will work incredibly well on slick, dull, fuzzy, fat, skinny or any other type of food. To begin peeling, hold the tool in your dominant hand, and hold the food in your other hand. The double blade design allows for left or right handed use with no modification. To remove skin, press the blade against the food, apply light pressure, and slide it away from your body. Slight pressure will remove just the outer layer, but increased pressure will remove more. Press down hard to slice veggies or hard cheeses. When you encounter eyes in potatoes, or yucky parts of other vegetables, use the tip to quickly eliminate them without slowing down. When you finish your food prep, hand wash or place in the dishwasher for cleaning. Why pay more for a tool that's not as good? This affordable kitchen gadget offers amazing performance that rivals any commercially used version, but it costs very little in comparison. You will be amazed at how effortlessly it glides through potatoes, carrots, apples and other foods, and you will wonder how you ever lived without one. Stop struggling with that dull piece of garbage you are using now, but don't drop a bunch of money to get something you think is better. You won't find a sharper fruit and vegetable peeler, or one that is so darn versatile. Use it on fuzzy foods, slick foods, hard stuff, soft stuff or squishy stuff, and the results will be the same. Quickly remove wide sections of peel, leave as much of the flesh intact as possible. A swivel style Swiss peeler for those that prefer a classic peeling knife design. Super sharp blade swivels and cuts in both directions. Order Yours Today! Best potato peeler I ever owned. The Swiss really know how to sharpen a blade.